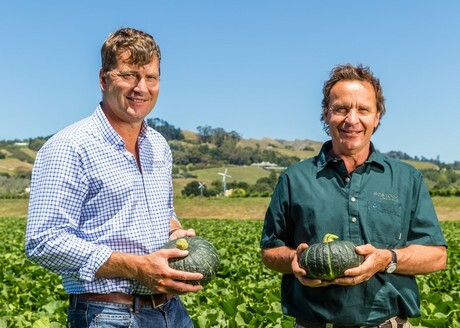 Two of New Zealand’s leading growers are putting some x-factor into the country’s squash industry by teaming up to grow the world’s most premium new squash variety, Marron d’Or. Bostock New Zealand and Leaderbrand have partnered for the first time to exclusively grow a new, superior tasting squash variety called Marron d’Or. Leaderbrand Chief Executive, Richard Burke says they recognise that the squash industry has changed and there is more focus from consumers on quality and taste. “As growers we need to alter what we are doing so we need to develop programmes like Marron d’Or. This variety is new and exciting and is already being snapped up in Asia. We teamed up with Bostock New Zealand because they are experienced in growing like us and a collaborative approach will be stronger. I think we can deliver together and will have the scale to market this variety together." “It is hard to grow squash well and get it right. It takes skills and experience and that is what both Leaderbrand and Bostock New Zealand have." Bostock New Zealand owner, John Bostock says Leaderbrand and Bostock are the heart of New Zealand’s squash industry so partnering to market and sell this new variety makes sense and is very exciting. "It's a Japanese variety that is not available in China. It has a sweet, nutty flavour - which is really delicious. It stays green for quite a period, and doesn't decay as quickly as other squash varieties. I think the Chinese are very receptive to new cuisine and new taste and something foreign and exciting such as this. It's a new taste to compliment the local Chinese squash that isn't as sweet and doesn't have the flavours." New Zealand squash volumes to China have been expanding at a rate of about 1.5 times every year, and very strong demand this year will see 2019 volumes more than double those of 2018. “Chinese consumers can’t get enough of our New Zealand Marron d’Or variety which is superior in terms of shelf life, colour and taste,” said Mr Bostock. Leaderbrand and Bostock New Zealand have introduced official Marron d’Or branding to export markets, and are pushing forward with marketing using social media, chefs and in-store promotions. The companies are differentiating themselves from the low cost, bulk growing, packing and selling model, and instead focusing on growing premium varieties and adding value in-market.